Home For the Holidays With the Occupy Movement! 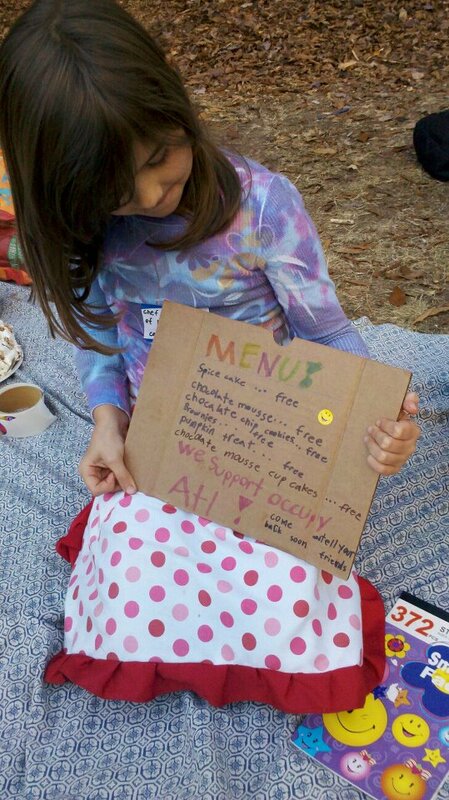 Two people on opposite sides of the country are able to spend the holidays at home due to last-minute interventions by Occupy Atlanta, Occupy Gwinnett, and Occupy Los Angeles. It should be noted that while all of the foreclosure occupations are relatively small, an even smaller number of people were involved in each of these situations. 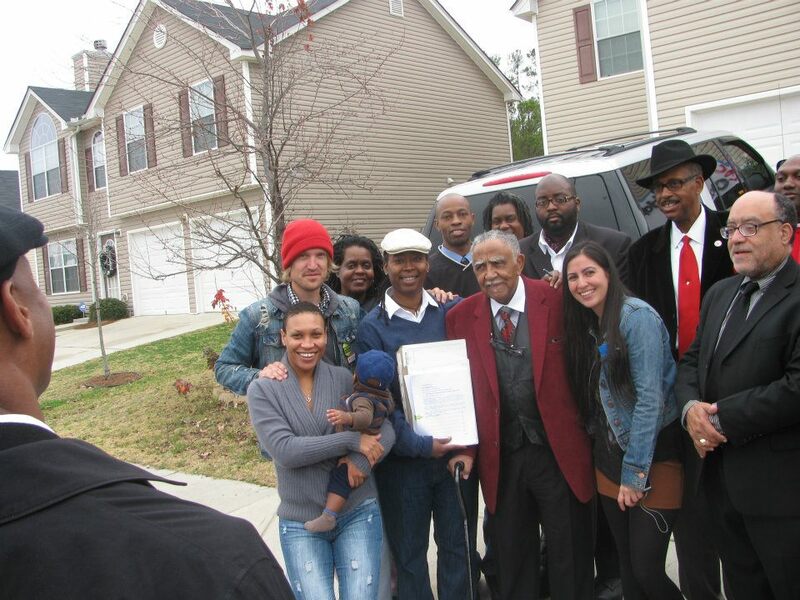 The willingness of only a handful of people from Occupy Gwinnett, Occupy Atlanta, and Occupy Los Angeles to intervene resulted in two families gaining a reprieve and the opportunity to save their homes. *Pictured above in Kenneth Glover. Brigitte Walkers Story Goes National! Brigitte Walker's victory not only means that she will be able to stay in her home, it's a call to action for everyone facing eviction or foreclosure! We are encouraged that the rest of the nation is picking up on her story. 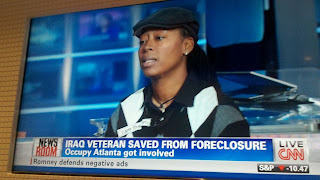 Brigitte Walker's willingness to resist her foreclosure, along side Occupy Atlanta is truly inspiring! 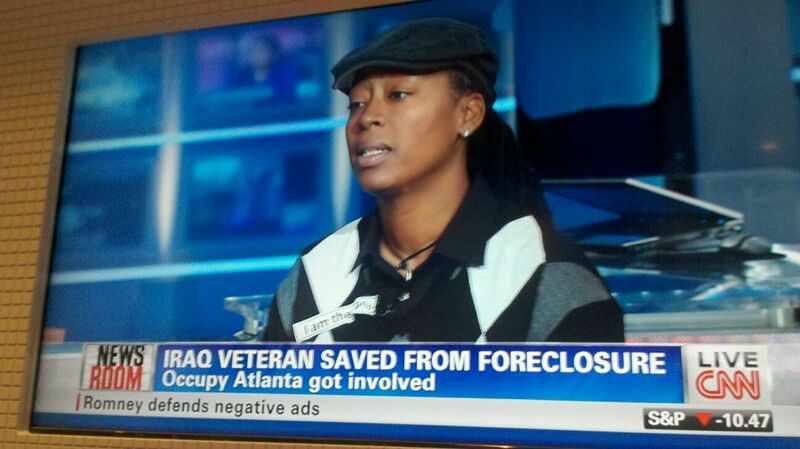 In late November, Brigitte Walker, a decorated Iraq War veteran received another foreclosure notice. Brigitte had unsuccessfully tried to modify her loan with Chase Bank since she medically retired from the army as a result of combat related injuries in 2007. 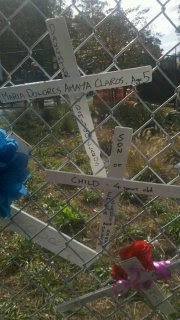 Her home was set to be sold on the Fulton County Courthouse steps on January 3rd, whether she was in it or not. Instead of making holiday plans or putting up a Christmas tree, Brigitte and her girlfriend Ajai were worried about losing their home. 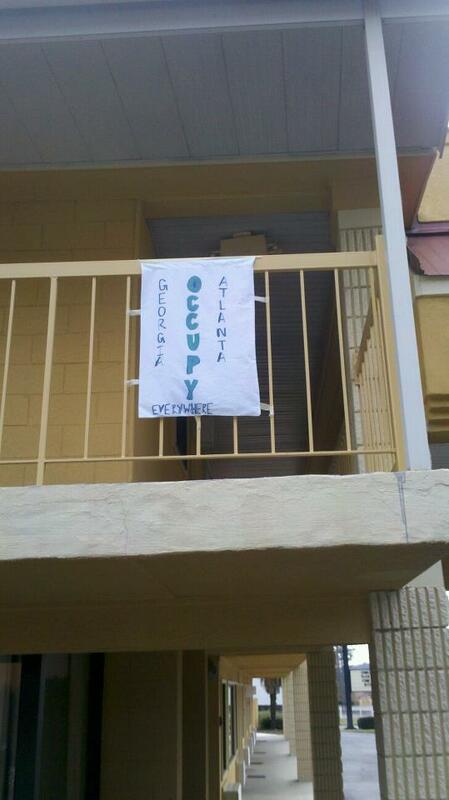 On a whim, Brigitte sent an email to Georgia state senator Vincent Fort, who set up a meeting with Occupy Atlanta. On December 6, after leaving the very same auction where Brigitte's home was to be sold the following month, we started occupying her home. The sad reality is that countless families in Georgia have their homes auctioned off at county court houses every month. Many believe that homes auctioned on the court house steps are unoccupied. 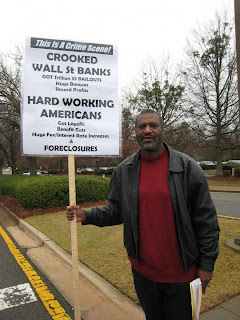 This is not true; Occupy Atlanta has seen multiple families begging auctioneers not to sell their homes. For many, this auction is the last nail in the coffin of their American dream, their home. Let's not get it twisted, the auctioning of occupied foreclosed homes in Georgia is nasty business. In Georgia, the foreclosure process can begin after just one missed payment. The lender then sets a sale date for that home to be auctioned off, and publishes the sale notice in the county paper. They are only required to give the homeowner 30 days' notice, and there is no requirement that the homeowner receives the notice, only that it is sent. If the sale goes through, there is no right of redemption in Georgia, meaning there is no way for a homeowner to reclaim their home. Disrupting the auction of a home literally gives a family one more month of housing, and in some cases one more chance to save their home. A six to nine month moratorium on evictions and foreclosures would allow time for bank inflated home values to be re-assessed to realistic payable levels. The banks' irresponsible practices played a huge role in our current crisis. In their time of need we bailed them out. Now it's their turn to do the right thing, to stop holding our economy hostage. 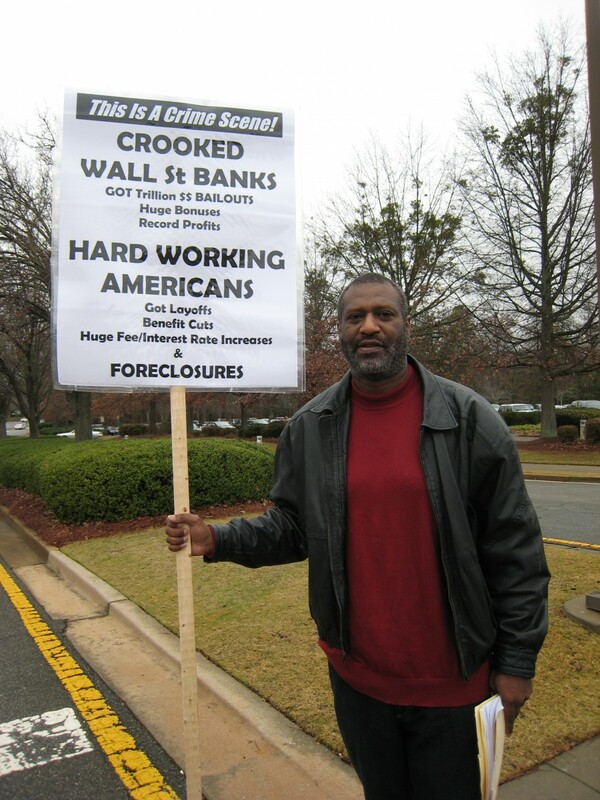 After two press conferences on her lawn, a national call in day, and direct action on Chase Bank, Occupy Atlanta did what Brigitte Walker couldn't do in years, get a loan modification. If it weren't for Occupy Atlanta and Brigitte Walker's willingness to resist foreclosure, she would have had her American Dream auctioned off on the Fulton county court house steps. Instead Brigitte Walker and her family can breathe easy knowing they can continue to live the American dream of home ownership. It should be noted that while we were fighting to save Brigitte Walkers home, we also spent a great deal of time organizing the South Hills community where she lives. In her neighborhood we found over a dozen abandoned homes, and many other families facing economic hardships. The developer gave up on the community in the latter end of 2007 and never finished the community center that was supposed include a pool, basketball court, and a space for meetings. The impact of this broken promise is deep. Children have nothing to do after school or on weekends besides wander around and play in abandoned buildings. Because the Banks make slightly more money on insurance when they evict then they do on creating modifications that keep people in, communities like South Hills are being held hostage by the big banks. Winning Brigitte's home is a win for the people. It should be a call for Georgians to fight for their homes, and fight for their neighbors' homes. Let's not forget, we outnumber the bank executives. American Friends Service Committee is proud to stand with and support Occupy Atlanta's actions to defend families from evictions and foreclosures. Occupy Atlanta launched it's first really, really free market on black Friday and has continued to organize one every weekend. 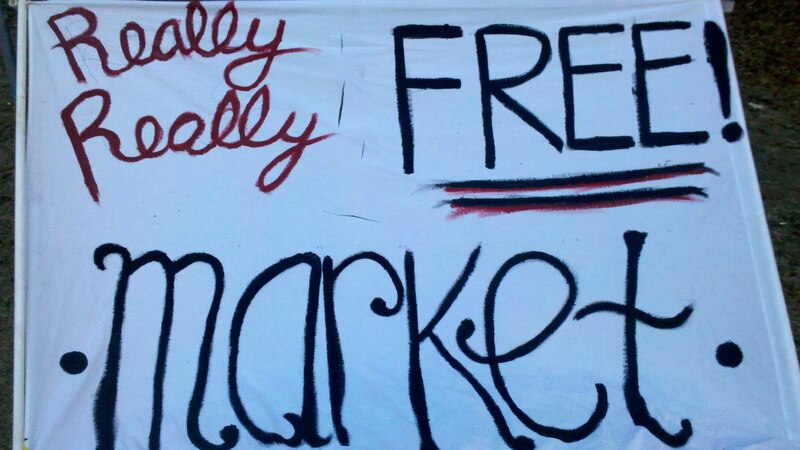 What is a Really, Really free market? It's a space where the exchange of money or goods is prohibited. Everything is totally free. Bring what you would like, take what you would like, it's all free. The really, really, free markets have not only been opportunities for folks to give and recieves items they may need, it's also been an opportunity to create dialogue about the problems with our current economic system. 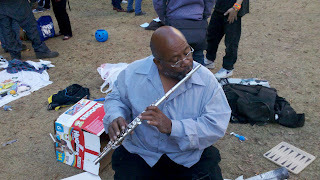 How can we meet each other our brithers and sisters in the spirit of community when our system is based on compitition? What is the real cost and real value of the items our society lifts up as treasures? 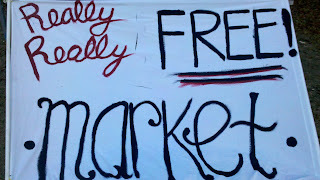 This Saturday at Troy Davis Park(formerly known as Woodruff Park) at 1pm there will be a final pre- Christmas really, really, free market. So come bring stuff, take stuff, and meet some new friends! This past November AFSC organized a workshop on how to demilitarize our communities at the yearly rally and vigil to close the School of The Americas. We also had an information booth at the gates of fort benning all weekend. AFSC was also excited to participate in a statewide effort to bring Occupy movements in the state of Georgia togther. Occupation movements from Atlanta, Augusta, Athens,Gwinnett, and Columbus came together to share ideas, progress, and possibilities. Ideas on colaberative work possibilities included coordinating home Occupations to save families from foreclosure and evictions and black Friday events.